Work together to collaborate and, where appropriate, coordinate resources to ensure the greatest possible impact consistent with the internal mission and goals of individual members. Provide an opportunity for public agencies, private businesses, and foundations or other funding organizations to share information and learn together about effective programs and promising practices in prevention and early intervention for children and families. 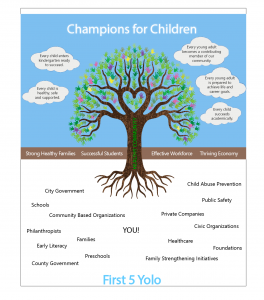 Provide advice and council to First Five of Yolo County in the mission to advance the health and early development of children 0-5 and the investment of public funds in this effort.